This is an 8″ diameter collectors bone china plate that is one of a limited production run of 2000. 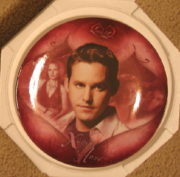 Produced in 2004 in Great Britain, this is one of four of the third series of the Buffy TV Series plates, and less than half of the total has been imported into the U.S. This is a collection of four different sets of lovers and this one features Xander and Anya. This is an 8″ diameter collectors bone china plate that is one of a limited production run of 2000. 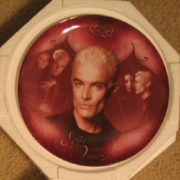 Produced in 2004 in Great Britain, this is one of four of the third series of the Buffy TV Series plates, and less than half of the total has been imported into the U.S. This is a collection of four different sets of lovers and this one features Spike and Druscilla. This is an 8″ diameter collectors bone china plate that is one of a limited production run of 2000. Produced in 2004 in Great Britain, this is one of four of the third series of the Buffy TV Series plates, and less than half of the total has been imported into the U.S. This is a collection of four different sets of lovers and this one features Willow and Tara. This is part of the FUNKO line of POP! vinyl figures and this series features characters from the classic Buffy the Vampire Slayer TV series, measuring 3.75″ high. This comes in a sealed illustrated box with a clear plastic front that displays the toy and it is stored in a smoke and pet free environment. This mint 9″ x 3″ slick full color sticker book features two each of 12 different detachable stickers from the hit cult TV show, Buffy, The Vampire Slayer. Each one has a cute saying from the show along with colorful artwork. Produced in 2014 by Funko, this is part of their ReAction action figure line. 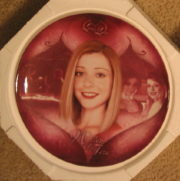 This one features the character of Buffy from hit cult TV series Buffy The Vampire Slayer. It measure 3.75″ high, she comes with a stake and is a sealed, mint on the card figure with the original punchout still attached. This is a black juniors, girls/womens baby doll style t-shirt bearing the images of Buffy, Angel, Spike and Willow on the front underneath the words Demons! Darkness! Dangerous Women! above the name logo, from the cult TV series Buffy the Vampire slayer. This is part of the FUNKO line of POP! vinyl figures and this series features characters from the classic Buffy the Vampire Slayer TV series, measuring 3.75″ high. This comes in a sealed illustrated box with a clear plastic front that displays the toy. 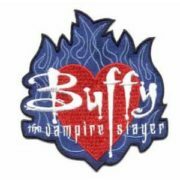 This mint patch features the heart logo, surrounded by blue flames, from the hit cult TV show, Buffy, The Vampire Slayer. It is an embroidered patch which measures 3 1/2″ x 4″. Produced in 2014 by Funko, this is part of their ReAction action figure line. This one features the character of one of thee Gentleman from hit cult TV series Buffy The Vampire Slayer. It measure 3.75″ high, and is a sealed, mint on the card figure with the original punchout still attached. Produced in 2014 by Funko, this is part of their ReAction action figure line. This one features the character of Oz from hit cult TV series Buffy The Vampire Slayer. It measure 3.75″ high, he comes with a guitar and is a sealed, mint on the card figure with the original punchout still attached. 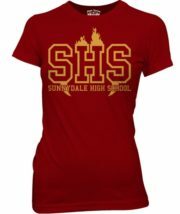 This is a maroon juniors, girls/womens baby doll style t-shirt bearing the SHS logo (Sunnydale High School) across the front, from the cult TV series Buffy the Vampire slayer. This is a 100% cotton, pre-shrunk, design featuring the logo of the vampire you love to hate. 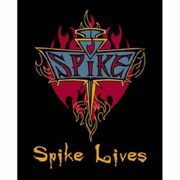 It is “Spike”, from the hit TV series, Buffy the Vampire Slayer, surrounded by flames (the final Buffy episode) with the words “SPIKE LIVES!” below his logo. Produced as a licensed exclusive for us, this is a new, never worn t-shirt, available from us in sizes Large, X-Large, and 2X-Large. 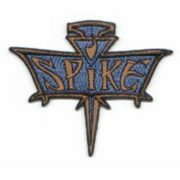 This licensed mint patch features the official logo of Spike from the hit cult tv show, Buffy, The Vampire Slayer. 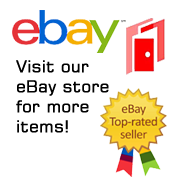 It is an embroidered patch which measures 3.25″ across. This is a cloth baseball style hat with a mesh back with the Buffy The Vampire Slayer Spike logo patch attached to the front. This is a new, never worn hat, available in either blue or black. If you do not choose we will send our choice. This is a cloth baseball style hat with a mesh back with the Buffy The Vampire Slayer name logo patch attached to the front. This mint patch features the logo from the hit cult TV show, Buffy, The Vampire Slayer. It is an embroidered patch, now out of production, which measures 3.25″ across. Produced in 2014 by Funko, this is part of their ReAction action figure line. This one features the character of Willow from hit cult TV series Buffy The Vampire Slayer. It measure 3.75″ high, and is a sealed, mint on the card figure with the original punchout still attached. This is an 8″ diameter collectors bone china plate that is one of a limited production run of 2000. 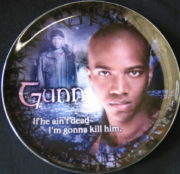 Produced in 2004 in Great Britain, this is one of four of the first series of the Angel TV Series plates, and less than half of the total has been imported into the U.S., and features Gunn. This is an 8″ diameter collectors bone china plate that is one of a limited production run of 2000. 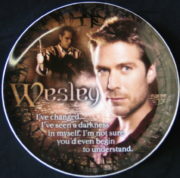 Produced in 2004 in Great Britain, this is one of four of the first series of the Angel TV Series plates, and less than half of the total has been imported into the U.S., and features Wesley. This is a mint, unread copy of this trade book that collects essays on the five seasons of Angel. 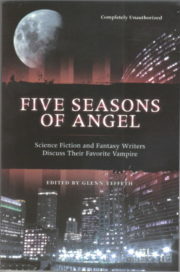 This collection of essays from fans who also happen to be big name authors and specialists in their fields (including New York Times bestselling author Jennifer Crusie, Last Unicorn author Peter Beagle, Buffy author Nancy Holder, Angel gaffer Dan Kerns, Chelsea Quinn Yarbro and many others) explore the constellation of characters and themes created in the popular Buffy the Vampire Slayer spin-off. 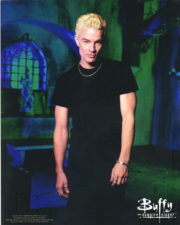 This is an 8″ x 10″ photograph of the popular vampire Spike, as played by James Marsters, from the TV series Buffy the Vampire Slayer.